Topics: Printers, Hewlett Packard, Refurb Printers, Copiers, Xerox, and Ricoh. It is hosted by Uk2 Infrastructure (England, London,) using Apache web server. 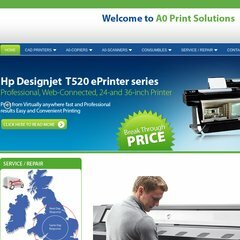 A0printsolutions.co.uk's IP address is 83.170.108.1. Its 2 nameservers are ultra103.uk2.net, and ultra104.uk2.net. PING (83.170.108.1) 56(84) bytes of data.